The assault on Chisaki's yakuza compound continues, as Midoriya and his allies seek to defeat the Hassaikai and save Eri. Though Midoriya and his squad are still trapped in the shifting corridors beneath Chisaki's base, one hero has gone on ahead - Mirio, apprentice of Nighteye, and greatest among U.A. 's many accomplished students. 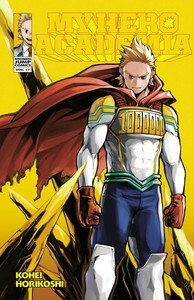 In a chamber far below the city streets, Mirio will square off with Chisaki and his most trusted lieutenants, putting his life on the line to save the girl he once failed to protect. Will this turn out to be these students' finest hour, or the darkest yet? Although the Hassaikai assault isn't necessarily My Hero Academia 's best arc yet, it's fair to say that it's undoubtedly the manga's most complicated. We're following a half-dozen separate teams representing at least three separate interests, with all their clashes complicated by the ever-shifting geography of the Hassaikai compound. And if the base mechanics of these fights weren't enough, this arc is furthermore juggling key personal arcs for Mirio, Nighteye, Suneater, Eri, and Chisaki himself, using these stories to create a running dialogue regarding how our histories shape our present identities. But somehow, all that structural complexity never results in a story that feels convoluted or unfocused. As blows are exchanged and beloved heroes crumble, Hassaikai rather seems like the firmest demonstration yet of Kōhei Horikoshi 's mastery of drama, and of the beating heart at the core of My Hero Academia . The volume opens with some lighter material, however, as we follow Twice and Toga while they debate how to most effectively betray the Hassaikai. Toga's been a weirdly charming presence ever since her first appearance, and Twice's recent backstory chapter went a long way towards humanizing him; collectively, the two of them act almost as a goofy commentary track for the ongoing drama. Great shonen action requires great villains, and even as this volume's central drama revels in the void that is Chisaki, I appreciated how the Twice and Toga material offered a tonal counterpoint, while also emphasizing that the League's feelings are far from monolithic. But though this volume opens with our League friends, the cover has the right of it: this segment belongs to Mirio. With his quirk enabling him to race past his fellows in the pursuit of Chisaki and Eri, Mirio ends up catching their foes long before any of the other heroes. It thus falls to Mirio alone to fight Chisaki and his closest allies, in a sprawling, brutal battle that demonstrates both the greatest and weakest elements of My Hero Academia 's art and action storytelling. I'll get the bad news out of the way first: like in the last volume, some of these chapters' action beats are so convoluted in their conception or vague in their visual illustration that it can be hard to tell what's actually going on. The defeat of whichever Chisaki associate was shifting the underground walls felt totally incoherent to me, and there were times when even straightforward sequences of punches or dashes felt difficult to follow. This issue was compounded by the fact that Mirio, a character who can phase through solid walls, found himself fighting an opponent who can reconstitute the environment around him, meaning there were times when it became impossible to gauge Mirio's moment-to-moment positioning. That said, if the visual clarity of these fights sometimes escapes Horikoshi, that's only because he's attempting such ambitious feats in the first place. Mirio's battle against Chisaki and his lieutenants is a stunning demonstration of Horikoshi's artistic prowess, from its lovingly crafted debris to its absurd sense of visual momentum. Even if the dialogue didn't outright validate Mirio's “acknowledging my weakness informs my strength” ethos, the desperate efficiency with which he attacks Chisaki's forces would make it clear. In just a few short volumes, Mirio has proven himself one of Academia's most engaging characters, and watching him stretch himself to the breaking point is both a thrilling and harrowing experience. Mirio's solo fight is so exciting, in fact, that it almost manages to eclipse this volume's true climax - the convergence point of all this arc's mini-narratives. As Mirio falters, Midoriya arrives with Nighteye beside him, soon to be followed by Ochako and Tsuyu literally piledriving a villain downwards through the ceiling. Characters we've followed for over a dozen volumes collaborate on the professional stage for the first time, demonstrating new innovations and rewarding all the time we've spent coming to care for them. And with both Mirio and Deku reaching out to her, Eri at last reaches back, a resounding embodiment of Academia's belief that the essence of heroism is not bravery or strength, but inspiration - hope. It's a stunning high point for Academia, and this arc isn't even over yet. I can't imagine what wonders Horikoshi will show us next.